Headwaters was designed for the modern family, from the state-of-the-art amenities to the progressive home designs. Headwaters’ home builders know exactly what today’s homebuyers are looking for and incorporate innovative features into each home they build. From home automation to outdoor living, here are five of 2018’s hottest new home trends, all of which can be found at Headwaters. Today’s homebuyers are turning away from the compartmentalized homes of the past and instead looking for homes that are less restrictive. That’s why homes at Headwaters feature wide open floor plans that make entertaining and family time effortless. Plus, open concept homes provide more flexibility to arrange your space the way that works best for your lifestyle. At Headwaters, many homes feature a flex space that can be adapted to meet your family’s changing needs. Work from home? Turn it into an office for a distraction-free work environment. Baby on the way? Make it a nursery, then a playroom as your kids grow. No space for hobbies? Whether you enjoy crafts, books or movie marathons, you can have a space for the things that matter most. Most homes at Headwaters feature either a front or back porch, and even a balcony. These expand your home’s living space and make it easier than ever to host a barbecue, watch the kids play or just sit back and enjoy some of the best views in Dripping Springs. And since many homes have the option to extend the back porch, you can finally have that built-in grill and outdoor fireplace that you’ve always wanted. Headwaters’ builders are bringing homebuyers into the Jetsons Age with home automation and technologically advanced features available in many homes. Imagine being able to adjust the thermostat when a cold front comes, unlock the front door when guests arrive or close the garage behind your forgetful teen from your smartphone or tablet. One of Headwaters’ founding principles includes stewardship of the land, so it’s no surprise that homes here include energy-efficient features. Programmable thermostats, better insulation, tankless water heaters, water-conserving dishwashers and high-efficiency HVAC systems are just a few of the green options available that can help reduce the impact on both your wallet and the environment. 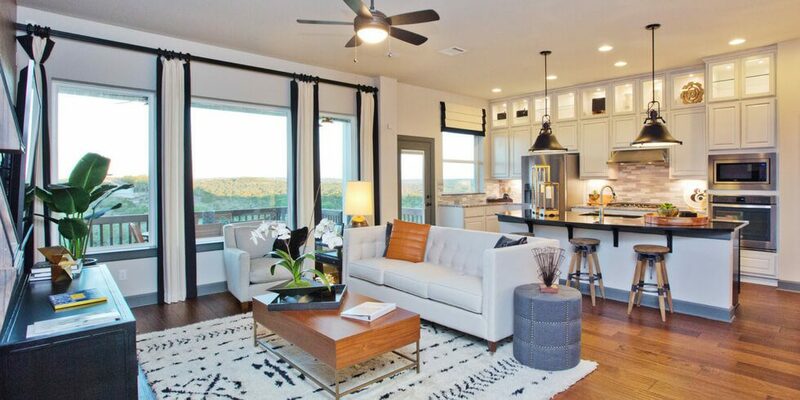 Want to learn more about the forward-looking lifestyle and modern home designs at Headwaters? Visit our model homes seven days a week, and join our Founders Club to receive news and updates.